Colt Police Positive in .38 Special and Colt Pocket Positive in .32 S&W Long. 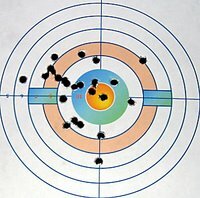 This Range Report will cover two vintage revolvers; the newest being sixty-two years old. 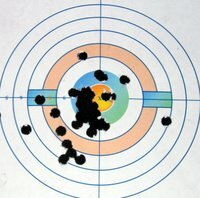 This week I took another vintage revolver to the range that I acquired during the winter along with a vintage revolver that I purchased from GunsAmerica.com last week. 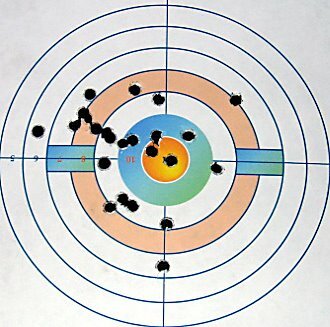 The target on the left was shot at 21 feet while the other one was at a range of 30 feet. Not bad for a gun that is 100 years old and still in completely original condition (other than the addition of the T-Grip). The Police Positive is a fairly small, lightweight revolver and the recoil of the remanufactured 158 grain lead swaged wadcutters was pretty substantial. The other vintage revolver was purchased this week from a gun dealer in Virginia off of his listing in GunsAmerica.com. 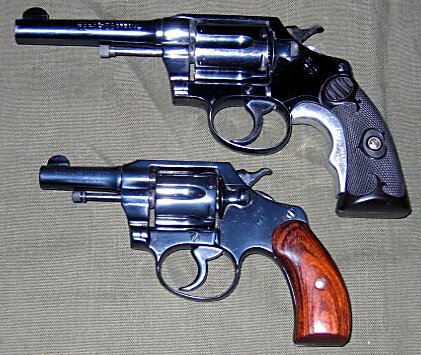 The Colt Pocket Positive was chambered in the .32 Colt Police Cartridge and sported barrel lengths of 2.5, 4, and 6 inches, although a pocket revolver with a six inch barrel seems a little ungainly. They must have had really large pockets back in those days. 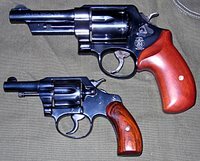 Smith & Wesson’s version of the .32 Colt, the S&W .32 Long, contained the same 98 grain bullet weight as the Colt .32 Police. However the S&W round was in a swaged wadcutter configuration rather than a round nose. 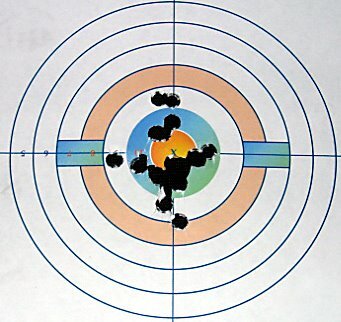 The S&W .32 Long also contained a little more powder which boosted the velocity by about 58 feet per second. This made the S&W cartridge more accurate, a little more powerful, and a lot more popular with the gun buying public. Colt continued to make the Pocket Positive up to 1947 however, ammunition manufacturers stopped making the .32 Colt Police Cartridges long before then.  Colt still put this caliber marking on the barrel as they could not bring themselves to stamp the letters “S&W” on a Colt made product. Again, the target on the left was placed at 21 feet while the one on the right was at 30. 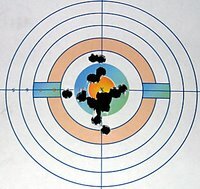 As you can see from the picture where it is placed under the Police Positive, the Pocket Positive is a very small revolver. 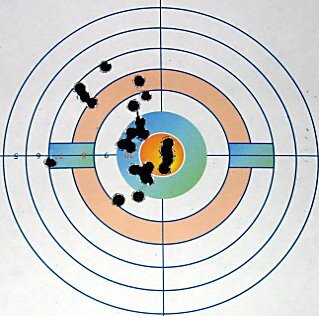 For a more dramatic comparison I also show it under a Smith & Wesson Model 21 .44 Special. 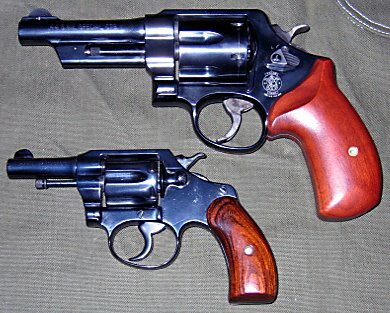 The aftermarket mahogany grips are a little more filling than the original grips would have been, but there were smooth and difficult to hold onto during double action firing. Upon coming home I went on-line and ordered a set of original Colt checkered hard rubber grips from Numrich Gun Parts. When these arrive I will add a Tyler-T Grip adapter and the handling characteristics should improve. One of the difficulties of purchasing a used gun online is that you are taking the seller’s word about the condition. From the description and picture of this revolver, it appeared to be in good shape. It had been reblued and handsome grips had been put on so I trusted that she had been cleaned and anything in need of repair was fixed. However, after receiving her and looking down the barrel I did not see any rifling. Upon inserting my bore light it was there, however very shallow. After shooting on Saturday I showed her to the gunsmith at the range. In his opinion, it was highly unlikely that this revolver had been shot enough to completely shoot-out the rifling. This little revolver is just not the type of gun that would normally see a lot of shooting time. He felt that as the gun had been reblued and had the grips replaced, it was more likely that the original owner shot the gun but never cleaned her. It was possible that the rifling could be filled up with compacted lead, powder residue and possibly some copper jacketing. This might also cause the accuracy to be less than desirable. He recommended a thorough cleaning of the barrel. Last night I filled the barrel with Outers Foaming Bore Cleaner and let it soak in for 30 minutes. The patches came out very dirty and the rifling appeared more prominent, but still subdued. I then reached for the Hoppes Benchrest Bore Cleaner. This is fairly nasty stuff and I had stopped using it some time ago as it is strongly ammonia based which requires that it only be used in very well ventilated areas. It also burns when it makes contact with skin. In fully reading the directions it stated that if the bore required a thorough cleaning it should be saturated and allowed to sit over night. I soaked a patch, ran it through the barrel and let it sit for 15 minutes. The dry patches used afterward came out pretty black. I then soaked two more patches, ran them through the barrel and let them sit overnight. This morning I ran a dry patch through the barrel and it came out looking like a referee’s shirt; white with very distinctive black lines on it, the black lines being the exact width of the rifling. Now in looking down the barrel the rifling is much more prominent. I will be interested the see how the replacement grips and the clean rifling affect the accuracy of this little gun.